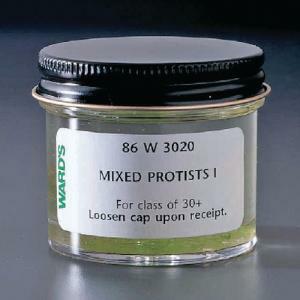 One jar containing a mixture of 6 different genera of algae. Each algae is cultured individually in Ward's laboratories, and mixed together immediately prior to shipment to ensure an adequate supply of each organism. The world is teeming with a wide variety of micro life, making studying samples of pond water complicated especially for the beginning student. To lessen the confusion, WARD’S has prepared different culture mixes that reflect protist combinations that occur in the real world, yet eliminates the hundreds of other life-forms found in a collected sample. Ordering information: Cultures include organisms from the following genera (species are not specified for these organisms): Chlamydomonas, Oscillatoria, Pandorina, Scenedesmus, Spirogyra and Ulothrix.